Due to Travel Leaders Group’s immense buying power, strong partnerships and international recognition as an industry leader, our travel advisors have access to exclusive programs that reward travelers with bonus services and experiences they cannot secure on their own. Explore a sampling of our exclusive programs below. Apex is an exciting program from Travel Leaders Group in collaboration with American Express®. 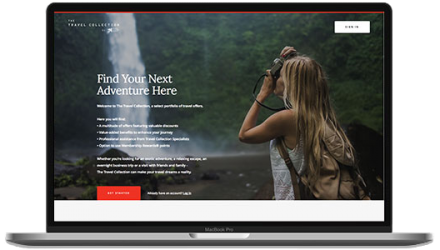 Through Apex, travel advisors can inspire customer loyalty, attract new clients, generate new revenue streams and offer exciting travel deals to close the sale. Participating advisors earn an incentive for each customer they refer that is approved for an eligible Card. Clients can apply for one of four powerful Card options, and we’ll help participating advisors with Card referral training, scripts and marketing collateral. To make the most of the Apex program, we ask that participating agencies agree to new Card Member goals, and we’ll help you determine what your target should be. Apex makes it easy for customers to redeem Membership Rewards® points for all or part of their journey booked through a participating Travel Leaders Group agency – and advisors earn their standard commission from their suppliers. Not only does this option help build customer loyalty, but advisors can also enjoy limited use of the Membership Rewards brand in agency marketing. Apex makes it easy for customers to redeem Membership Rewards® points for all or part of their journey booked through a participating TLG agency – and advisors earn their standard commission from their suppliers. Not only does this option help build customer loyalty but advisors can also enjoy limited use of the Membership Rewards brand in agency marketing. Our international hotel division provides valuable support to our members through exclusive value-added amenity programs and offers. These programs reward travelers with bonus services and experiences, and they reward agencies by enhancing both commissions and client loyalty. This elite collection of 1,200 of the world’s most distinguished and desirable luxury properties provides travelers with VIP-worthy amenities to craft unique and memorable experiences. Travelers enjoy exclusive benefits and amenities at over 2,000 luxurious, private villas in over 50 destinations throughout Europe, the Caribbean and the Americas. This curated collection of luxury spa, health and wellness lifestyle properties is the ideal solution for travelers in search of relaxation and revitalization. Our comprehensive, price-competitive hotel program provides the Best Available Rates at over 40,000 international hotel brands and independent properties. Enhanced Commission is an exclusive offer to Travel Leaders Group agents based on partnerships with the most distinctive properties worldwide. Commissions from participating properties range from 15% to 20% on rooms and suites. Check out the video below to learn more about our exclusive hotel programs. Our complimentary cruise programs include over 3,500 specialty departures around the world. Wherever clients wish to explore, whichever cruise line they desire, our advisors can provide them with bonus amenities and exclusive experiences. Our hosted cruise collection of sailings includes a private cocktail reception, an exclusive shore event and the expertise of a Distinctive Voyages Host. Travelers have a choice to tour the destination in comfort on a pre-selected personal tour or on an “at their leisure” tour. Food and wine enthusiasts can savor a world of experiences on these culinary- and wine-themed sailings from our premium and luxury cruise line partners. Travelers enjoy special amenities like shipboard credit, free specialty restaurant meals, wine and Champagne, and pre-paid gratuities at no extra cost.